This spring/summer transition brings the good, the bad, and the green: allergies and asparagus. I have mixed feelings about this, since I really, really love fresh asparagus straight from the garden, but really, really hate that my allergies go crazy this time of year. This particular year, there’s a new symptom I’m not used to: dizziness. It’s nothing too heavy or too debilitating. It’s more like lightheadedness (which according to my spell check, is a word). I figured it had to do with my diet and breastfeeding, but it just started this week and I’ve been very consistent with both. So I did some research, and I came across this article: Breastfeeding and Dizziness. The author, Jessica Lietz, provides a number of possible causes for the dizziness, all of which I was able to rule out for myself…except allergies. So I’m resolved to drink more water and get more sleep. Easier said than done. And, as usual, I will continue taking my vitamins and eating vegetables. Like asparagus (which brings us full circle). For an easy vegetable side, I just steam the asparagus until a fork spears them without too much resistance (thought retaining a little firmness is key…you don’t want mush). Then I mist them with my olive oil sprayer to keep the calories and fat down but give them a nice olive oil taste, and sprinkle them with course sea salt. Done and done. 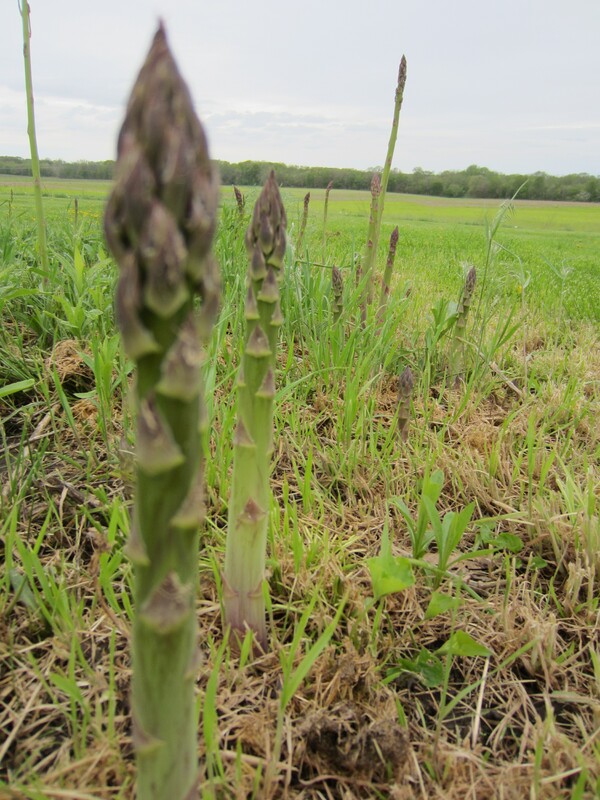 From Farm to Table: Asparagus! If you have the opportunity, or more importantly, the time to start an asparagus patch, I highly recommend it. Grandpa and Granny Bell spent a couple of years getting this patch going and from what I understand, it wasn’t an easy task. But once the asparagus garden is strong, it’s pretty much maintenance free. Weeding more would probably help produce more asparagus, but right now, there’s enough for Thomas and I to pick more than enough for dinner about once a week. Isn’t it crazy how the asparagus stalks just pop right out of the ground? I had no idea! Cool, huh?